Listowel Emmets G.A.A was saddened to hear of the passing of Sean Wight this morning in Melbourne after a short battle with cancer. Sean Wight, along with Jim Stynes, (pictured on the far right with Jim Stynes) was part of the infamous 'Irish Experiment', although Wight was actually Scottish by birth. Before playing Australian rules he played Gaelic football with the Kerry minor team who made it to the 1982 All Ireland Final and with the Listowel Emmets GAA club. He is not only the first player to be associated with the Irish experiment, but also considered to be one of its most successful products. 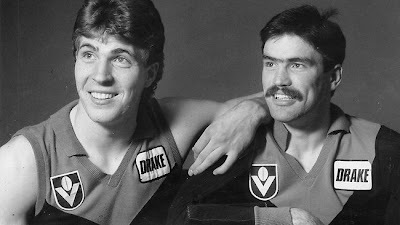 Wight was the pioneer of the scheme, brought back to Australia by Barry Richardson and Ron Barassi. Wight arrived in the country on Grand Final Day 1982, having heard the advertisement about the scheme passed on to him just two months before by an aunt who thought he might be interested. Before this, his only encounter with the game had been through watching it on television. Blessed with great athleticism and a phenomenal spring, Wight made an immediate mark on the competition. One of his most lasting memories was of having Tony Lockett as his first opponent in a senior game, out at Waverley in 1985. Wight, who was made a Life Member of the Club in 1994, and who also served as a Director upon retirement.